The aroma of Cardamom Essential Oil is warm and spicy and initially similar to eucalyptus. The middle notes are balsamic-woody and slightly sweet bordering on floral. In perfumes, the oil is coveted for its spiciness, warmth, and sweetness. In addition, it blends well with bergamot, olibanum, ylang-ylang, labdanum, woods and cilantro. The health benefits of Cardamom Essential Oil can be attributed to its properties like anti spasmodic, neutralizes adverse effects of chemotherapy, reduces nausea, anti septic, anti microbial, aphrodisiac, astringent, digestive, stomachic, stimulant, diuretic etc. Cardamom Essential Oil is extracted from seeds of Cardamom whose scientific name is Elettaria Cardamomum. I don’t think I need to introduce Cardamom to you all over again. It is extensively used and admired as a spice around the world. The main constituents of this essential oil are Sabinene, Limonene, Terpenene, Eugenol, Cineol, Nerol, Geraniol, Linalool, Nerodilol, Heptenone, Borneol, Alpha Terpineol, Beta Terpineol, Terpinyl Acetate, Alpha Pinene, Myrcene, Cymene, Neryl Acetate, Methyl Heptenone, Linalyl Acetate and Heptacosane etc. Apart from its culinary uses, you know it as a mouth freshener. * Anti Spasmodic: Cardamom Oil is equally beneficial in curing muscular and respiratory spasms, thereby giving relief in muscle pulls and cramps, asthma, whooping cough etc. * Anti Septic & Anti Microbial: It has very strong anti septic and anti microbial properties, which are safe too. If used as a mouth wash by adding few drops of this oil in water, it disinfects the oral cavity of the germs and drives away bad breath. It can also be added to drinking water to kill germs in it. It can also be used in food stuffs as a flavoring agent, which, on the other hand, will keep them safe from spoiling under microbial action. Mild solution in water can be used to bathe to disinfect the skin and hair. * Digestive & Stomachic: It is the essential oil in Cardamom which makes it a good digestive. This oil boosts up digestion by stimulating the whole digestive system. It is also Stomachic which means it keeps stomach healthy and functioning properly. It helps maintain proper secretion of gastric juices, acids and bile in the stomach. It also protects stomach from infections. * Stimulant: It stimulates things up. This stimulating effect also boosts up spirit in cases of depression, fatigue etc. It also stimulates secretion of various enzymes and hormones, gastric juices, peristaltic motion, circulation, excretion etc. thus maintaining proper metabolism. 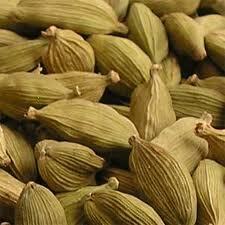 * Warming: Cardamom Oil has a warming effect. This effect heats up the body, promote sweating, helps clear toughened cough and also gives relief in cold. It also gives relief in headache resulting from cold and used in curing diarrhea caused due to effect of extreme cold. * Diuretic: It promotes urination, helping lose weight, lower blood pressure, remove toxins and clean calcium and urea deposits in kidneys. * Aphrodisiac: Cardamom Oil has arousing effects. It helps cure sexual weakness, erectile dysfunctions, impotence, loss of libido or frigidity etc. * Other Benefits: Cardamom Oil helps neutralize effects of tobacco, insect bites and ingestion of mild poisons, clear bowels, cures colic, removes bad breath, cures oral infections and toothache etc. Few Words of Caution: No toxic effects have been noticed. Ingestion in overdose may result in unrest and extra heating up of the body and the digestive system, resulting in loose motions and irritation. Pregnant ladies and lactating mothers are advised not to intake Cardamom Oil, since the irritation or warming effect may harm the baby. Blending: Cardamom Oil blends well with Rose, Orange, Bergamot, Cinnamon, Cloves, Caraway and Cedar Wood Oil.